Skin with look and feel smooth and supple. The complexion will look radiant and evened out. Doesn't dry out the skin. Spread several dabs of Resurfacing Cream over the face on clean damp skin, avoiding the eye contour area, the lips and the nostrils. Massage for one to two minutes in circular motions from the inside to the outside of the face. Finish with energetic smoothing movements over the nose and chin. Rinse with lukewarm water keeping the eyes tight shut, then gently pat the skin dry using a clean, dry towel. 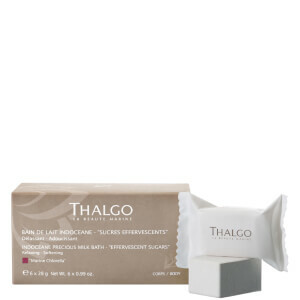 Apply your Thalgo face cream followed by a sun cream offering at least SPF15 protection. To be used once a week.